Art pieces make a unique and thoughtful gift. With the holidays approaching, everyone is looking to find gifts that will show their loved ones how much they care. What better way to honour the pet lover in your life than with a custom drawing of their furry friend - past or present? 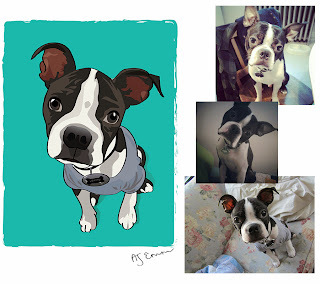 With only a few weeks left until the Holiday deadline (all orders must be placed by Dec. 1 in order to receive the finished piece before the holidays), AJ Emm wants to give you a gift:a custom portrait of the special pet (or person) in your life. One lucky winner will receive a single pet illustration or a digital portrait, custom made based on their own loved ones pictures. Click here to order your portrait now and enter below for your chance to win. Next, we'd like to announce our own very special upcoming event: an auction to benefit Save a Sato rescue in Puerto Rico. When I attended the BlogPaws conference in May, I was lucky enough to win a beautiful black diamond paw print pendant from the ASCPA. Unfortunately, I don't really wear jewelry so I have decided, with approval from the ASCPA, to auction off the necklace and donate the proceeds to Bella's original rescue, Save a Sato. I haven't worked out all the details yet but as soon as I do, I will post all the information here, so stay tuned. To sweeten the pot, I will double match the winning bid (up to $500). This would make a lovely holiday gift for you or the dog-lover in your life. We are very excited to have this opportunity and most grateful to the ASCPA for their generosity. Bear with me as I work out the logistics of this. A full post with the details about it will be coming soon. This and That Thursday is brought to you by 2 Brown Dawgs and Ruckus the Eskie. That necklace is GORGEOUS. I have one that is similar, but not quite as stylish. I hope it raises a woof load of money for Save a Sato. A friend of mine got both her Satos through them. They sound amazing. That necklace is beautiful! I hope you raise lots of money! My Beautiful Bella! <3 I'd love to have her forever commemorated in a drawing. You are awesome to donate the necklace and match! We just LOVE you!!!! P.S. Thanks for sharing the giveaway! If I won I would have my Pomeranian Neko drawn. What a beautiful necklace, and a very generous offer from you! I wonder if that is the same rescue where my cousin got her dog not too long ago. Though it may just sound familiar because I've read about it on here! What great gift ideas! Hope the necklace raises "tons" of money for the rescue. Oh yay, you can comment again! I was so worried that your not being able to comment would prevent you from being able to enter the contest. Thanks for stopping by! There are several rescue groups on the island of Puerto Rico. Save a Sato is one of the oldest and not necessarily as fancy or cutting edge as some of the new ones popping up. I actually do support the newer ones as I can but SaS will always be where my heart lies. I asked her and she got her dog Lady through Sato Heart Rescue. She said she had a great experience and now volunteers for them. Thanks so much for participating in TNT. I am a bit late visiting...sorry. That necklace is beautiful. Very generous of you to auction it. I bet you get a lot of bids. Thanks for hopping on to TNT! I joined the rafflecopter. Hope to win. Can't wait to see what you have in store for tomorrow's This N That Thursday!